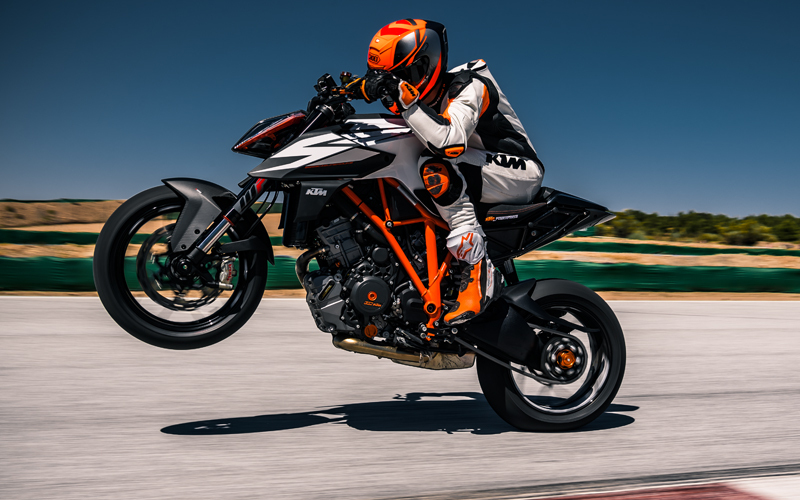 The KTM 390 DUKE's state-of-the-art chassis, with its lightweight steel trellis frame, makes this bike a real master in the bends. With mass grouped close to the center of gravity, it has maximum maneuverability and precision – ready to win the rush-hour slalom day in, day out. The KTM 390 DUKE is all motorcycle. It's a 390, but with plenty of room to move around on it, the only numbers that count are the number of corners you can drop into and the number of days you can head out on the tarmac. The upright riding position and relaxed geometry add up to unlimited amounts of cornering fun. The KTM 390 DUKE, although small in size, boasts huge riding attitude. One look at its sharp lines and twin LED headlights and you're hooked by its full-offensive stance. Its READY TO RACE glare definitely grabs attention wherever it goes and, on closer inspection, it's the high-quality parts that seal the deal. No two KTM owners are alike. The KTM PowerParts range boasts a huge variety of accessories across its motorcycle range, which are all developed alongside their chosen machines, meaning that KTM riders only get parts that perfectly complement their ride and provide the same 'factory fit' straight from the dealer. The ultimate tool for creating a ride that fits your unique style and needs.